Browse through the gown and dresses listings by size, category, and color. Also, post your gown for sale or rent on our website today. Somebody out there wants it, they just don�t know about it. Get more for your wedding! 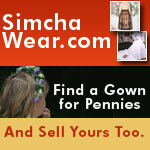 Don't forget to mention ChossonKallah.com when visiting SimchaWear.com.